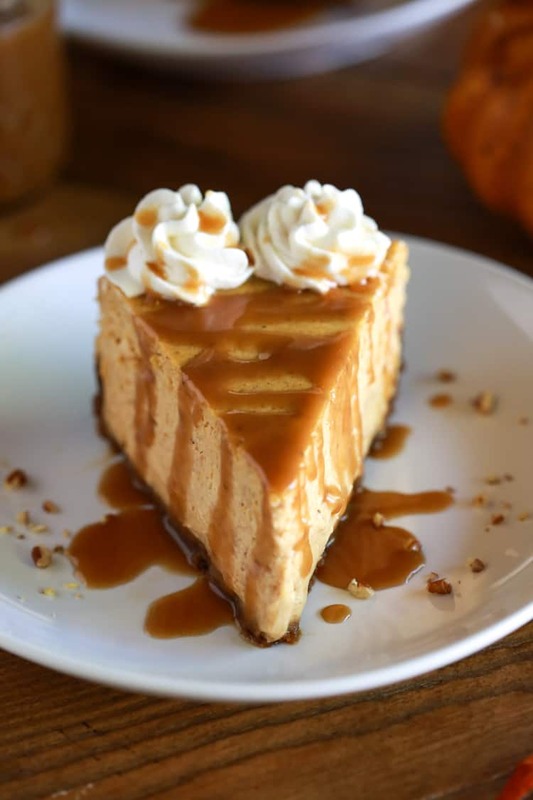 This amazing Pumpkin Cheesecake with Caramel Sauce is sure to become your new favorite fall dessert! 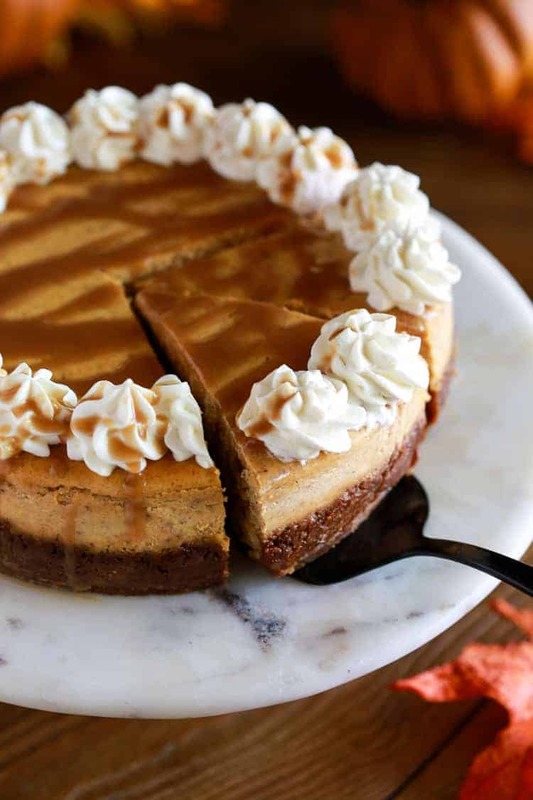 It starts with a simple homemade gingersnap crust, then a layer of silky pumpkin cheesecake, topped with whipped cream and a drizzle of caramel sauce. Hey everyone, this is Lauren visiting again from Tastes Better from Scratch. Today it’s all about this incredible, restaurant-quality pumpkin cheesecake with caramel sauce. Whether you’re a cheesecake making novice, or making homemade cheesecake intimidates you, this recipe is easy enough for everyone! 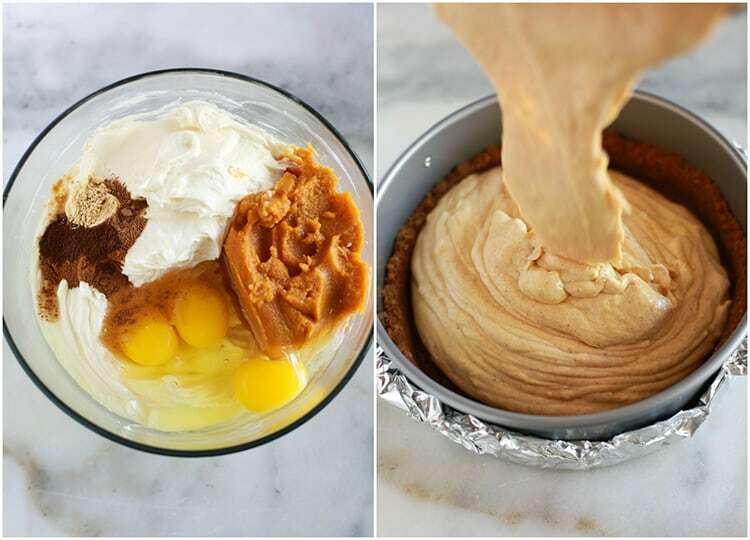 I like to bake pumpkin cheesecake with a gingersnap crust because I love that flavor combination, but you could also use a graham cracker crust. Cover the outside bottom of an 8-inch springform pan with foil. Make the gingersnap crust and press the crumb mixture into the bottom and half way up the sides of the pan. Bake at 350 degrees for 5 minutes. Add the filling ingredients to a bowl and mix until smooth, but don’t over mix. Pour the batter into the pan. Bake in a water bath for 60-70 minutes, or until the sides of the cheesecake have set and the center is just barely jiggly. Remove the tinfoil and allow the cheesecake to cool completely on a wire cooling rack, then refrigerate it for several hours before serving. Use a food processor to crush the cookies into fine crumbs. Measure out 2 cups of crumbs and pour them into a mixing bowl. Add ¼ cup sugar and melted butter and stir to combine. Cover the outside bottom of an 8-inch springform pan with foil, securing the foil partway up the outer sides of the pan. Press the crumb mixture into the bottom and about half way up the sides of the springform pan. Bake the crust for 5 minutes. Remove from oven and set aside while you make the cheesecake filling. In a large mixing bowl combine the room temperature cream cheese, 1 cup of sugar, and vanilla. Mix with an electric mixer until smooth. Add the pumpkin, eggs, cinnamon, cloves, ginger and nutmeg and mix until smooth, but don’t over mix. Pour the filling into the prepared pan. Grab a pan that’s larger than the cheesecake pan and fill it with about ½ inch of water, to make a water bath. Place the cheesecake pan inside the dish with the water. Bake for 60-70 minutes, or until the sides of the cheesecake have just set and the center is just barely jiggly. Remove it from the oven (it will continue to bake as it cools). Remove the tinfoil and allow the cheesecake to cool completely on a wire cooling rack. Once cooled, cover the pan with plastic wrap and refrigerate for several hours, or overnight. When the cheesecake has chilled in the fridge, remove the pan sides (I like to gently run a dull butter knife along the inner edge of the pan before I release the springform pan sides). Serve with caramel sauce (homemade or store-bought) and whipped cream on top, if desired. Consisted of the best season’s ingredients, definitely a keeper ! Gorgeous photos, too ! I am currently trying to.make this recipe and I can not seem to find the baking temp for the crust or the actual cheesecake. Am I missing it somewhere in the post? Will using fresh pumpkin gain same results?? No where in the printable recipe, does it say what temperature to cook this at!